I adjusted my duffle bag over my shoulder and held the letter at arm’s length, not impressed by the gray-speckled business stationary. My father’s name overpowered the custom logo: Elias Whitaker. Each word jabbed me straight in the gut. “I love you. I miss you. Please forgive me.” Wadding up the paper, envelope and all, I tossed it into my wastebasket just as Mom passed my room. “He’s still your father.” She stood, wiped her cheek, and unfolded the wrinkled wad of worthless excuses. My father had let me down again and again. My heavenly Father’s record wasn’t much better. “Yeah, right!” I threw my gear into the passenger seat, swept a half-empty bag of barbeque chips onto the floor, and slid behind the steering wheel. Elias traded us in for a new wife and their baby, born a month after the courts made the divorce official. Even without Honor’s classes, I could do the math. I downed an energy drink as I sped to the stadium. What if I never made it to the game? The thought of my mom alone in the bleachers slammed me back into reality. That wouldn’t make things better, for me or her. I crushed the empty aluminum can and hurled it at the dashboard. A month later, Elias moved to the East Coast with his new family. He called less, making it easier for me to stay mad. When my anger erupted into punching walls, Mom shipped me off to a boot camp, for my own good. At the Mount Calvary Youth Retreat, under a sky splattered with stars I never bothered to notice before, I asked God to help me believe Him again. Mom accepted my apology without a hitch when she picked me up from the church a week later. I grabbed my dusty Bible from my closet as soon as I got home. She’d stashed the crinkled, gray-speckled envelope between the crisp pages. Good try, Mom. Shoving the letter in my sock drawer, I set the black leather book on my nightstand. I read Scripture daily, went to youth group weekly, and served in the sound booth once a month. As a master at tuning out sermons and skipping over verses that taught forgiveness, I clung to bitterness like a fourth quarter lead on the scoreboard. A few months before graduation, Mom got a call from Elias’ cell phone. After two full weeks of praying, I hopped onto an eastbound plane. I unpacked my carry-on in my aunt’s guest room and thanked her for letting me borrow her Cadillac. Scattered oak trees, their gnarled branches hardened and scarred, stood firm against the bullying wind. Glaring at the manicured lawn, I hunched out of the car, staggered by a slap of cold air. Billowing clouds darkened the horizon. Why would God answer me? All this time, I gripped hate like a game winning catch. I shut my father out. Always disappointed, defiant, demanding. Boots clump-clumped on the cobblestone walkway. My grace is sufficient for my power is made perfect in weakness. I prayed for the courage to let go, as the steps stopped behind me. How could I be forgiven for all the times I’d spoken without considering the serrated edges of my insults? He stooped just long enough to place flowers on a neighboring, weathered headstone. Facing the pale marble in front of me, I read the words carved across its polished surface: Elias Whitaker, Beloved Husband and Father. My slow obedience always had me lagging three steps behind and, this time, two weeks too late. Jaw clenched, I plodded past the stranger. I bet he didn’t miss out on the years replaced with a dash on his loved one’s grave marker. Crackling leaves whipped around me, scraping across the cobblestones as I trudged toward the lonely parking lot. I squinted as the sun pierced through the gray clouds, rays of light cutting across the dark canvas. The stuffed yellow bunny I’d picked up at the airport smiled at me from the passenger seat. I adjusted the floppy ears and lopsided pink bow. Not perfect, by a long shot. But, it was a start. An edited version of “The Apology” by Xochi E. Dixon, published in Inspire Victory, 2014. This version of “The Apology” by Xochi E. Dixon, edited to under 1000 words, as is customary of Flash Fiction, January 2016. I sat at the kitchen table and folded the crisp pages of the bill we received after my last shoulder surgery. We owed over forty-eight thousand dollars. After incurring extra expenses when serving as my mom’s live-in caregiver, we depleted our savings. Still, God provided every time a need arose. Not once did my husband hesitate when I asked him to send supplies or told him about unexpected expenses during my time away. But this? I pressed my face into my hands. I don’t know what to do, Lord. Considering that my husband had recently taken a severe pay cut after nearly a year of unemployment, even paying half the amount of this medical bill would require years of payments. I mulled over my minimal options, unfolded the letter, and laid it flat on the table. I called the office, explained our situation to the billing clerk, and asked her for a payment plan as I held back tears. As the on-hold music played, I prayed. Your will be done, Lord. After we said goodbye, I called my husband to share the good news. His response mirrored mine. For a brief moment, I considered saving the bill. But why would I want a constant reminder of what I used to owe? The doctor had forgiven our debt. Completely. In Matthew 18:23-35, Jesus shares “The Parable of The Unmerciful Servant.” In this story, a king decided to settle his accounts. When a servant realized he was unable to pay the amount owed, he pleaded for mercy. The compassionate king canceled his debt of ten thousand talents. The servant immediately left the king’s presence and went looking for a fellow servant who owed him a hundred denarii. When he found his fellow servant, he choked him, demanded full payment, and refused to offer mercy. He had forgotten the mercy the king had showed him for a debt much higher than what his fellow servant owed. In New Testament times, ten thousand talents equaled to several million dollars. A denarius compared as chump change, a whopping sixteen cents. One hundred denarii could be earned and repaid with three months wages. But ten thousand talents amounted to an overwhelming debt. When the king heard about the unmerciful servant, his anger burned. He rebuked the man and threw him in jail to be tortured until he could pay back all he owed. Whenever I struggle with forgiveness, I ask God for a reminder of what forgiveness means. Forgiveness is an ongoing choice empowered by the Holy Spirit, a difficult journey requiring a daily commitment. Forgiveness is a conscious choice of freeing the forgiver, not pretending the sin never occurred. Forgiveness isn’t an act of minimizing or justifying the sin of the offender. Forgiveness isn’t dependent on the guilt of the offender. Forgiveness is a direct reflection of the heart of the offended and their personal relationship with God. When we forgive, we’re trusting the Lord to judge and offer mercy to whom He chooses. We’re taking responsibility for our own sin, recognizing our need for grace and forgiveness, and understanding others have the same need. Sometimes, it seems as if evil reigns and sins go undetected. But, the Bible teaches we will all be held responsible for everything we’ve done, including our willingness or refusal to forgive others. The King of Kings will settle every account when He returns. But will we be willing to follow His example and obey His command to forgive, no matter what the personal cost? When my doctor wrote off our account balance, he forgave our overwhelming financial debt out of the goodness of his heart, not because of my actions or words. In the same way, God offers forgiveness to those who repent and turn from their sin, because of His own goodness. 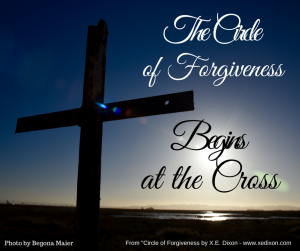 The circle of forgiveness begins at the cross. An intimate exchange that begins with us, as individuals, in loving surrender to God, forgiveness is a command, not a request or a good idea. This hasn’t always been an easy concept for me to grasp. In the past, I excused my unforgiveness by comparing my sins to the sins of those who hurt me. I justified my unforgiveness as a response to being hurt. When forgiveness feels impossible, we can ask God to help us see ourselves and others through His eyes. We can ask Him to give us compassion for others who, like us, desperately require God’s grace. When we consider all Christ did for us, all He gave for us, all He has forgiven us, our icy hearts melt into submission and loving obedience. In His power and by His grace, our forgiveness toward others will begin to flow freely, more often than not. Lord, thank You for knowing how hard it is for us to trust You to decide who deserves mercy, especially when we’ve been hurt. Please reveal our own sin to us and help us to stop comparing ourselves to others. Give us courage to commit to living a lifestyle of forgiving, as we remember You alone are qualified to be judge. In Jesus’ name, Amen. A version of The Circle of Forgiveness: The Parable of the Unforgiving Servant by Xochi E. Dixon was previously published on the FBCVV Blog in March 2015. Photo take by and used with permission from Begona Maier. God blessed me with an opportunity to serve through the ministry of Deeper Waters this week. If you want to know a sure fire way to grow deeper in your personal relationship with God, please check out my devotion “Bible in a Box,” published on the Deeper Waters website. Join this wonderful team of women as they encourage others to read through the book of Joshua and experience the life-transforming power of meeting God face-to-face in Scripture. If you’re encouraged by any of the devotions on their website, please take a moment to comment and/or share them through your social media links. We never know how God can use the stories we share to minister to the heart of a sister we didn’t even know was struggling or longing to know God more. Thanks for your continued prayerful support and encouragement. It’s a blessing to be growing with you, Sisters. Meme created by and used with permission from The Deeper Waters Team. When my husband flung a few harsh words my way, I slapped my shiny righteous anger badge on my chest, yelled my retort, and commenced operation silent treatment. But, having read through the Bible yearly since 2005, I knew the verses I dreaded would eventually be smacking me in the face. There they were in Tuesday’s reading. Smack! Slap! Pow! Bam! In your face! Whew! I’m safe, Lord. I’m mad at my husband, not my brother. If God was anything like me, He’d have rolled His eyes at that pitiful attempt at trying to convince myself my sin was prettier than my husband’s. In His goodness, though, He extended grace without missing a beat. That was close, Lord. I’m not offering a gift at the altar. I don’t go to church until Sunday. That gives me a few more days to stew while I wait for an apology. There was a problem with that faulty reasoning. My being right doesn’t make my wrongdoing right. 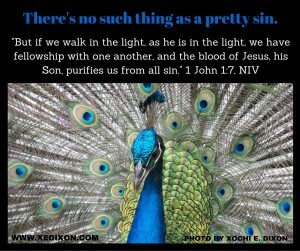 My sin separated me from intimacy with God. That was a price I didn’t want to pay, no matter who was right or wrong. And if I was honest, I had to admit we were both wrong. As I loosened my grip on the lame excuses, God drew me nearer to His heart and deeper into Scripture. That word didn’t describe my feeling toward my spouse. Technically, I was hurt not angry, wounded not enraged or hostile. My response, then, should have matched my emotion. But, it didn’t. The yell-reflex and silent treatment slid me deeper into sin and away from my desire for holy living (Colossians 3:7-10). My sin didn’t cause my spouse to change or feel remorse for his own sin. So, I did what I know works. Obedience. 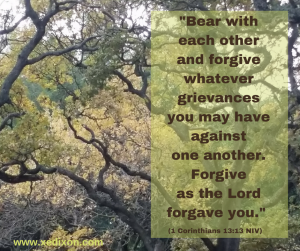 I asked God to forgive me and to help me forgive my husband. I called my husband, apologized for my part, communicated my feelings calmly, and set healthy and holy boundaries. Then, I committed to trust God to work out the details as He helps us continue to work toward reconciliation in this delicate matter. Each and every one of us will hurt others and be hurt by others while navigating through life together. God doesn’t say we shouldn’t feel anger. 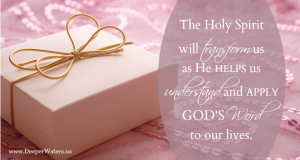 He does, however, offer five verses to help us learn to deal with anger in godly ways. Respond, don’t react. Spending time alone listening to God’s voice will help us respond in calmness. When we immediately jump into defense mode, we’re more likely to distort another person’s meaning and intent, or fail to see our own contribution to escalating the problem. The chance of blowing small things out of proportion, or saying something we regret, becomes greater. Striking back, harder, has always been my first response to being hurt. Over the years, God has helped me tame my anger and my tongue by teaching me how to S.P.I.T. (Stop. Pray. Inhale. Trust Jesus!). I don’t always S.P.I.T. first, but I’m getting better at taking a few deep breaths and looking for a spittoon before heaving verbal daggers that make things worse. When we’re venting our anger, words can easily become vicious counter attacks. The you-hurt-me-and-I’ll-hurt-you-worse mentality will destroy relationships and hinder our intimacy with God. Taking time to process feelings will help us understand why we’re hurt or angry, before we fling sharp-tongued spears that can’t be taken back. Forgiveness is a choice, empowered by the Holy Spirit, to release the offender into God’s hands. When we’re hurt or angry, it’s important to accept our feelings as valid. We can ask God to reveal our part of the conflict (if we have a part), and help us process our feelings. Reconciliation isn’t always possible, since we can’t control others, but peace resides in a heart that embraces emotions instead of becoming entangled in them. Seething with frustration, bitterness, and resentment can make our tempers flare and our grace fade. We can become short-fused, critical, or prone to complaining. These red flags tell us we need to open ourselves up to accountability. We may even need to seek a professional to help us discover the root of our anger and give us tools to manage our out-of-control emotions. When learning to deal with anger in godly ways, it’s vital to remember that none of these helps will amount to much without God’s intervention. We need consistent time in prayer and Bible reading so that the Holy Spirit can saturate our minds and our hearts with His truth. We also need safe people to offer us accountability and encouragement. We have to be willing to listen to honest feedback and submit to God’s Holy Word, if we want to reflect His character and enjoy intimate relationships with Him and others. Lord, thank You for reminding us that we’re controlled by the Holy Spirit, not by our emotions. Please reveal the deep roots of our anger and any other sinful attitude or behavior that causes us to inflict pain in the lives of others, or feeds our own hearts with growing bitterness, resentment, or anger. May peace rule in our lives and flow into all our relationships. In Jesus’ name, Amen. Are you more likely to respond or react when someone hurts you or makes you angry? How has God helped you to improve in the way you respond when you’re hurt or angry?